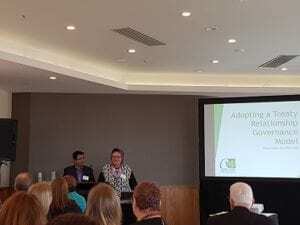 OTNZ-WNA are being noticed and were invited to share our journey to achieving a two house treaty relationship governance model at Australasian Society of Association Executives (AuSAE) meeting held in Wellington recently. Harsh Vardhan, President tangata tiriti and Whaea Iris gave a informative presentation, which was well received. excellent balanced presentation – you guys have really thought it through. I would love to invite your organisation to present at our Board/council meeting (several requests – left contact card). What resonates with me is the fact that you have emphasised you are on a never ending journey. AuSAE recognises the importance of the leadership stance OTNZ-WNA have taken in being the first allied health association in New Zealand to authentically and practically practise a two house treaty relationship governance model, tangata whenua and tangata tiriti working together to honour the treaty. “In sharing our journey we hope that other organisations will eventually also adopt this model”. OTNZ-WNA.